If you've been to NCRC training, you may have seen or used a jigger. 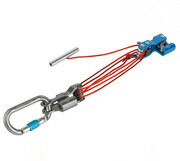 It is a small, compact mechanical advantage (hauling) system. It's quick to set up and possible for one person to operate. Well, Mammut is making one that looks pretty slick. Likely available in the spring of 2013, $140. Scott McCrea wrote: If you've been to NCRC training, you may have seen or used a jigger. It is a small, compact mechanical advantage (hauling) system. It's quick to set up and possible for one person to operate. Nice, but it's not something you will take underground on a regular basis. Interesting. They set it up to function as a fixed jigger or as a traveling haul. Well, maybe a little. I came up with my micro jigger design back in 2004. The Mammut one looks much slicker, but I bet mine cost less. I've found my new ascending system! Lightweight, compact. A tad slow, maybe, but soooo easy on the bod! NSS8921 wrote: I've found my new ascending system! Lightweight, compact. A tad slow, maybe, but soooo easy on the bod! Let's see, that one looks like a 6:1, not a 4:1. So... let's see Fantastic... you'll be lifting how many feet exactly? My first thought was that there wasn't much travel in the system, but that's easily solved by using a different cord. 140 bucks is all for those neat little ascenders. Are the pulleys bushing or bearing I wonder?